When you talk about wine regions and wine with your wine mates, the conversation probably never goes to Hungary. Why should it, its not like they make great wine or we would have heard of it. Right? Yeah nah, they do and you haven't! 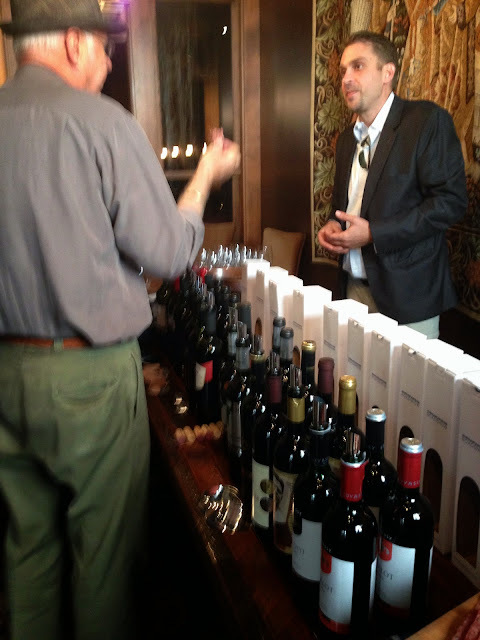 We were fortunate enough to get to taste a couple dozen nice examples recently at a media and industry tasting in San Francisco at the Hungarian Wine Roadshow and we were very surprised (in a good way). While maybe not the next great wine region it is very good and one not to miss. Wine was introduced to Hungary by the Romans, and the country was known for its excellent wines until the devastation of World War II and the Communist era. Recently Hungarian wines have had quite the renaissance with their 22 designated wine regions. 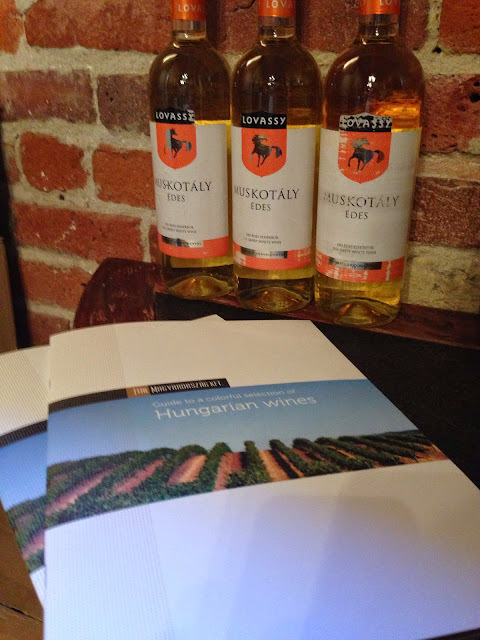 There are even unique Hungarian wines, such as Furmint or Hárslevelű from Tokaj, which cannot be found anywhere else in the world. The Hungarian Wine Roadshow was a great chance to taste them first hand. Even the internationally-known wines made in Hungary are just a little different or special depending on your point of view and taste. The number of hours of sunshine is also a little different from their neighbours to the west in this region and a grapes maturation time is longer, add to that the the south facing slopes with their volcanic soils, and you get a combination of natural conditions that with the the expertise of talented wine makers result in slightly unique and fine wines. These factors make even more of a difference in comparison to wines of other close by countries. Hungary's climate is very favourable for quality wine growing because the average temperature is much higher than let's say in Northern France, and autumn is rather dry with warm, sunny weeks until mid-October. The country’s distinctive geographical conditions ensure that these varieties do stand out from the crowd. Hungary's wine regions have some unique characteristics like around the area of Lake Balaton which has lots of sunshine, while the subsoil of the Tokaj Wine Region cannot be found anywhere else. 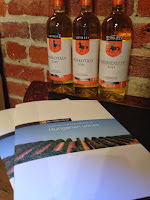 Tokaj was declared a World Heritage Site in 2002 under the name Tokaj Wine Region Historic Cultural Landscape. However, its fame long predates this distinction because it is the origin of Tokaji aszú wine, the world's oldest botrytized wine. Their goal is to get their wine into the US market. Among the wines presented were many that are organically grown, traditionally produced, handcrafted, and aged in Hungarian oak barrels. Hungarian wines they say are healthy. They are produced according to very strict food quality standards and they contain no genetically-modified ingredients. 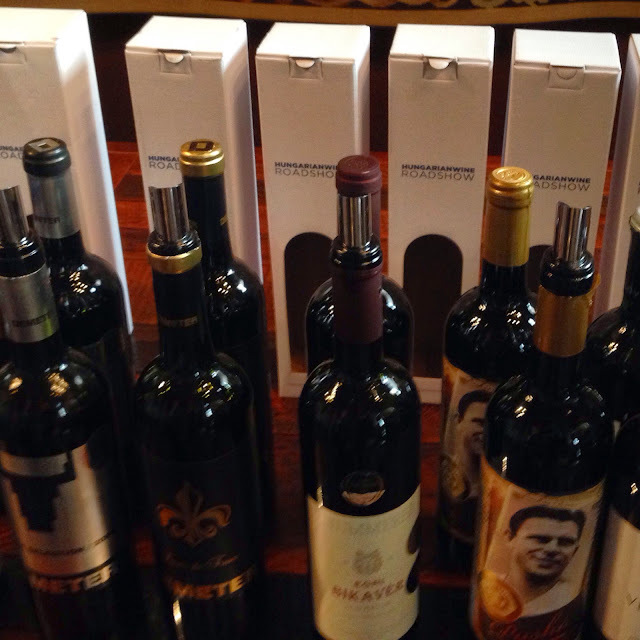 The outcome of this tasting experience is that we would not hesitate to purchase Hungarian wine. It is good! We have also put Hungary on our travel wish list. Thanks to the Hungarian Wine Roadshow for the great hospitality and sharing your lovely wine. Till next time, Cheers! We have secured a few bottle samples and will be doing a review on these so stay tuned. Leg two of the trip was to be handled by Virgin Australia from Sydney to Adelaide. Running late from the previous leg of the journey with a previously mentioned nostalgia carrier I discovered a brilliant idea being used by Virgin Australia. As the crowd rushed to the gate there was, for those catching flights that were about to leave, extra lines for just that. They were well staffed as the crowd ebbed and flowed and they did not let the line get more than 4-5 deep when another service window would open. This allowed those of us that were about to panic to quickly and efficiently get checked in and through to the shuttle that was waiting to take us to the departure lounge. What a relief to have experienced some great forethought and people management put into action. They even held the transit shuttles to make sure we all got on and were delivered in time from the check in to the departure lounge. The Virgin Australia plane was very nice, clean and seemingly well maintained. The cabin staff were attentive, attractive (bonus) and effective at their job (taking care of me). Based on this first experience with Virgin Australia we give them a 'Recommend', and will be giving them the first opportunity to take care of our flying travel needs in Australia. 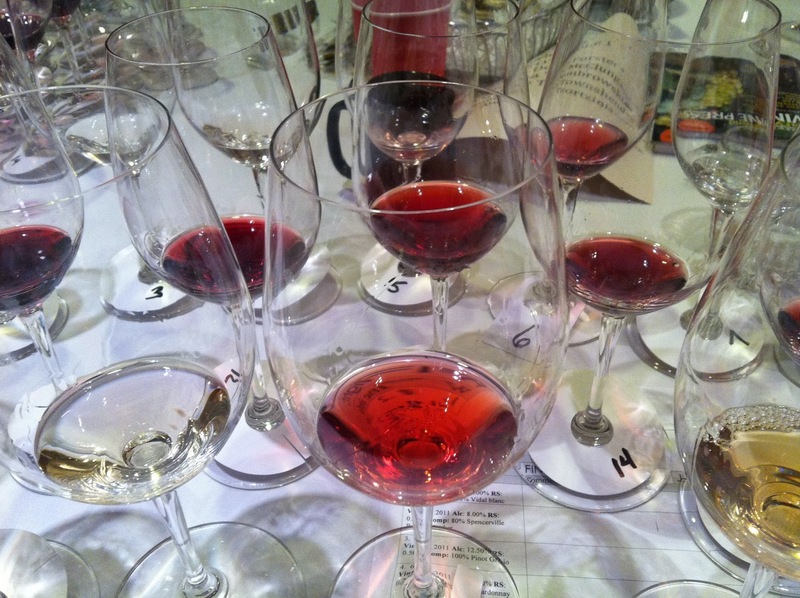 Lessons from a big tasting tour. Well it had to happen soon enough with all the things going on that some divide and conquer had to occur. With Kiwi off doing, let’s say “yard work”, Koala was the nominee to take a small (4 tasters) group wine tasting in Monterey County. Taking the job seriously he got stuck into trying to select a route and three or four wineries. 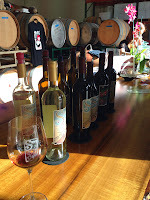 The task of giving the group a nice cross section of tastings and allowing lots of time to soak up the atmosphere and enjoy the offerings at each tasting room was not going to be easy. A vast amount of experience and research would need to be combined to create this epic event and Koala was up for the challenge. Ok, so as Kiwi so eloquently pointed out the road was there and was lined with tasting rooms every mile or so, so just pick four that are equally spaced already! 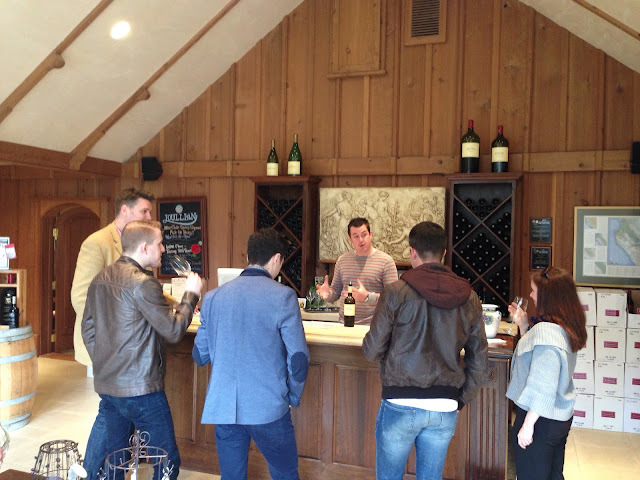 As the dawn broke on the big day the group of four tasters became a dozen. The plan was rapidly unraveling. Now some may think the more the merrier but having worked in a tasting room and having dealt with the surprise onslaught of a large group when already busy is not cool. The set up with the first winery of nice cheese and cracker plates to get them started off on a high note and also to make sure they had some food in ‘em was now potentially barely a nibble each which might just make em cranky. Since there were only four tasters originally there were no call aheads to any other of the tasting rooms. Now it was Sunday morning and the chances of warning them were slim. Calls were hastily made to all the published numbers and connections were made with, none! Look, here's the thing. 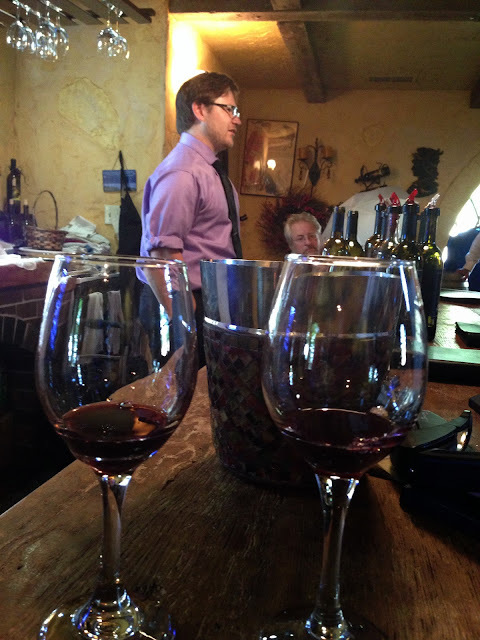 A small group of 2-6 can be corralled to listen to the winery person and engage and learn and taste. A group of a dozen or more becomes like herding cats and becomes more about quit disrupting our yammering with wine stuff and just put more wine in my glass. The heading of this story is ‘Lessons from a big tasting tour’ and the first lesson is twofold. First up have a contact number that whoever you are going to taste with will answer. That way if the situation changes you can warn them whether it be running late or tripling your numbers giving them the chance to adapt, or if the circumstance warrants, cancel. Next when planning the event spend a little more time trying to determine who is interested and create a event that has a fixed (plus or minus 1 or 2) number of attendees. Otherwise you are potentially not going to get good service and you may potentially ruin the tastings of all the other people at the tasting room. The next lesson was about time management and was more of a confirmation of what was put into practice. In some areas it would be easy to squeeze in 10-12 tasters with the understanding, that at that point you are not tasting but drinking small glasses of wine quickly and moving on. Tasting takes about an hour and then there’s getting loaded with your purchases and driving to the next place. 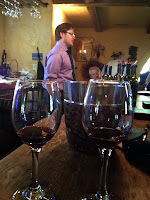 You should also allow some float time for the tastings where people get engaged and are learning and enjoying. Koala was cool as a goanna in the shade, and instead of ditching the herd of cats he forged on like a true Digger's son should. The day went well and we would like to thank the wineries involved for their hospitality and good wine; Ventana Vineyards Soledad Tasting Room, Paraisio Vineyards, Hahn Winery and Pessagno Wines. Look for future Adventures with these Wineries. 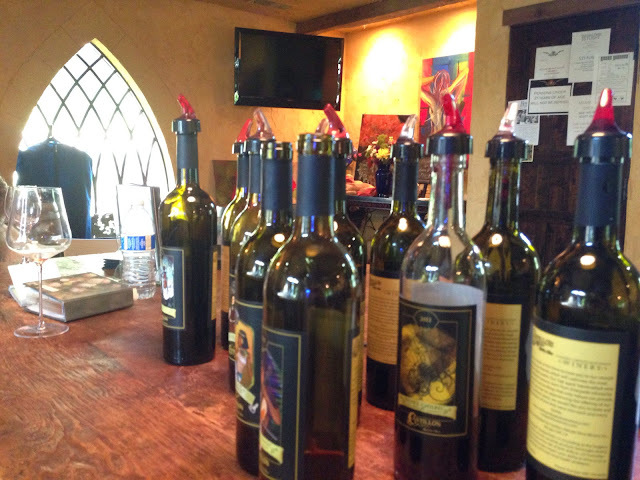 These tasting rooms are all part of the Monterey County River Road Wine Trail and all of the wineries on the trail are worthy stops. P.S. We even learned that wine can be turned back into water!! 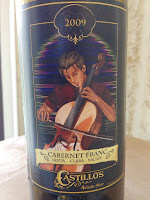 The wine that caught our attention this week is a wonderful Cabernet Franc from Castillo's Hillside Shire in Morgan Hill California. The labels here are just simply works of art as well as being really interesting. 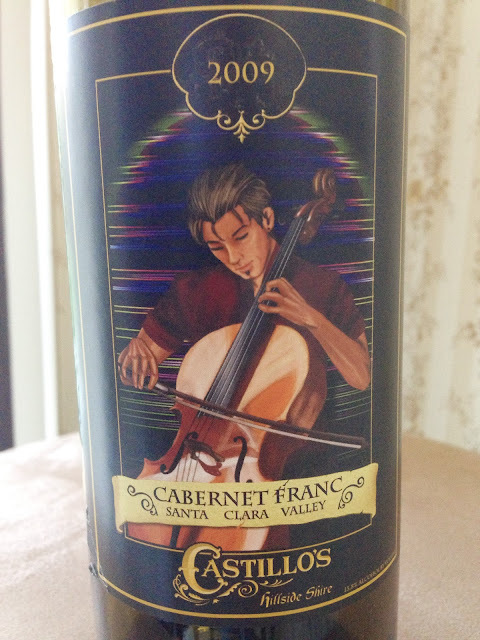 Nate Castillo says of the Cabernet Franc label that "Music is the biggest part of my life, so here we have Frank, a musician engaging in his favorite pass-time." This is the 2009 but the 2008 was judged at San Francisco Chronicle Wine Competition awards Best in Class and this 2009 is a really nice drop as well. Cabernet Franc is one of the major black grape varieties grown worldwide. It is principally grown for blending with Cabernet Sauvignon and Merlot in the Bordeaux style but has also become a fairly common stand alone varietal as well. This is a bright pale red wine that has finesse and a light peppery perfume and hints of tobacco, raspberry, blueberry, bell pepper and violets. It is well balanced and can be enjoyed on its own or with just about any food with a hint to a bit of spiciness to it. This is a **** wine that rates a 6-7. Head on over to the Hillside Shire and find your favorite and let us know what it is. While your there say g'day to Nate and let him know we sent you. What better way to escape the the Coastal fog (yes, June Gloom is here) than a quick jaunt up Carmel Valley Road to taste a little wine. Spontaneity is good, but so is tried and true. 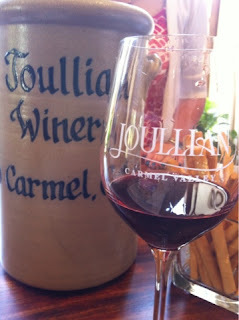 So we took the group on a spontaneous trip to Carmel Valley Village, and a stop at Joullian Vineyards tasting room. 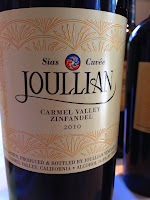 Joulian never disappoints, and has something for all tastes. Due to the winery’s remote location, Joullian opened its tasting room in the charming Carmel Valley Village to help introduce visitors to Joullian wines. 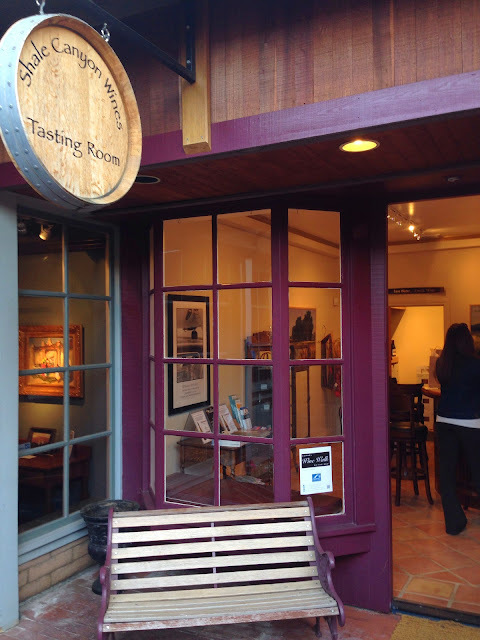 The tasting room is located in the heart of Carmel Valley Village, just 1/2 block south of Carmel Valley Road upon the west entrance to the village. 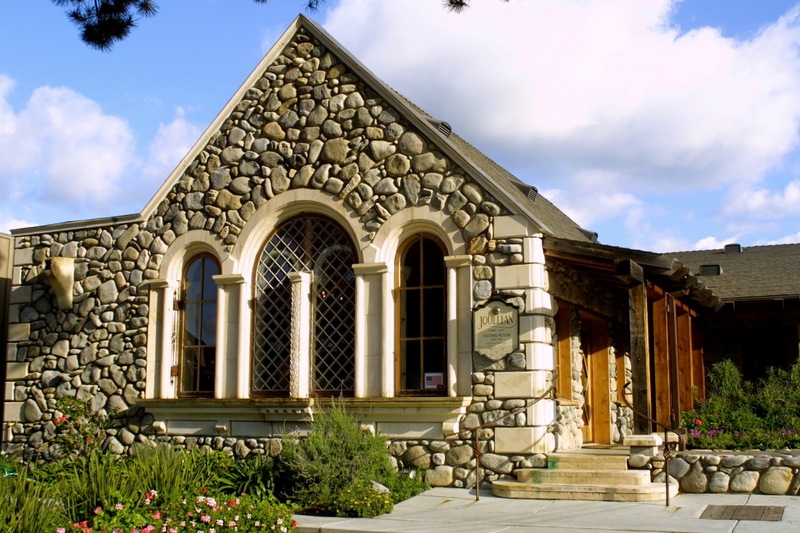 This quaint little Village plays host to a myriad of fine hotels, lodgings, restaurants, specialty shops and other local winery tasting rooms. Joullian Vineyards specializes in estate-produced Cabernet Sauvignon, Sauvignon Blanc and Zinfandel and Monterey appellation Chardonnay. The 2013 Family Reserve Sauvignon Blanc which is a blend of rich, ripe Sauvignon Blanc with juicy pomelo flavors and low sugar, crisp Semillon to boost minerality-then topped off with a dollop of Viognier for aromatic intrigue and complexity. Yes it is! Our white favorite at the moment. One of our other favorites was the great drinking nice bold fruity zin, that drinks well now and will stand the test of time with a few years in the bottle. 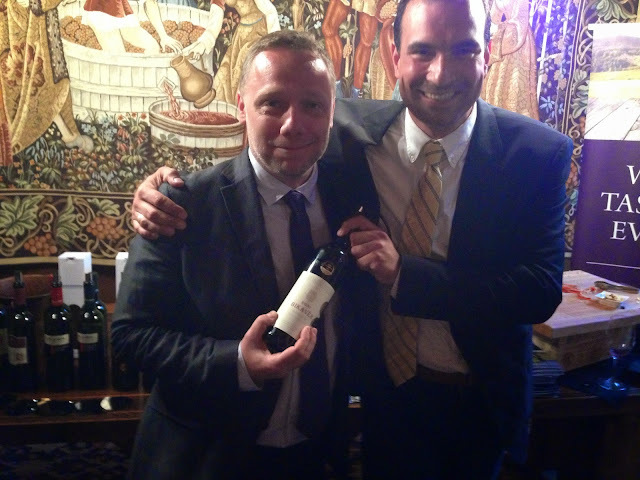 This just so happens to also a winner of a Best in Class in the 2014 San Francisco Chronicle Wine Competition! Rates 6+ and **** on the K&K scale. Purchased a bottle to take home, but there's a good chance it won't get to age more than a few days! So go and get your own bottle, and taste the other nice wines on offer. And tell 'em Kiwi and Koala sent you. 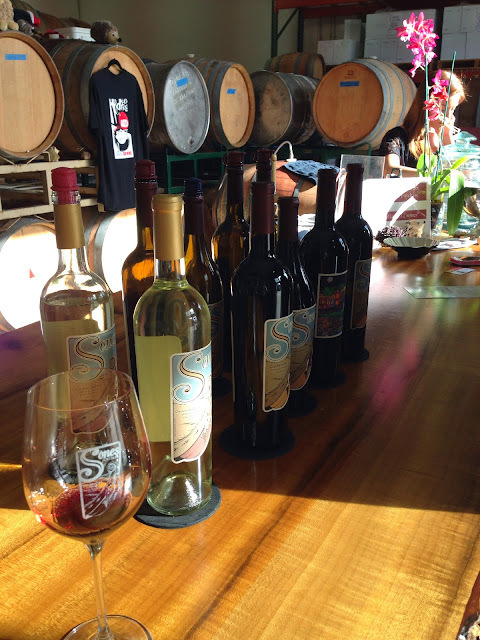 Tasting Room is open daily from 11am-5pm excluding major holidays (Tel. 831 659-8100). Learn to cook authentic Italian in Tuscany. While trying to find things to do during our Italy Adventure "that is not going to be all about wine" Koala found many cooking lesson opportunities. However that being said most were very expensive or did not suit the needs of the group or the trip schedule. The need / plan was for the ladies to enjoy their own cooking Adventure and then when the boys finished with their wine adventure, they would rejoin the girls to consume their cooking (brilliant plan). The discovery and eventual booking with Authentic Tuscany - Cooking Classes in the Chianti hills was as it turns out a stroke of great luck (Koala says genius). 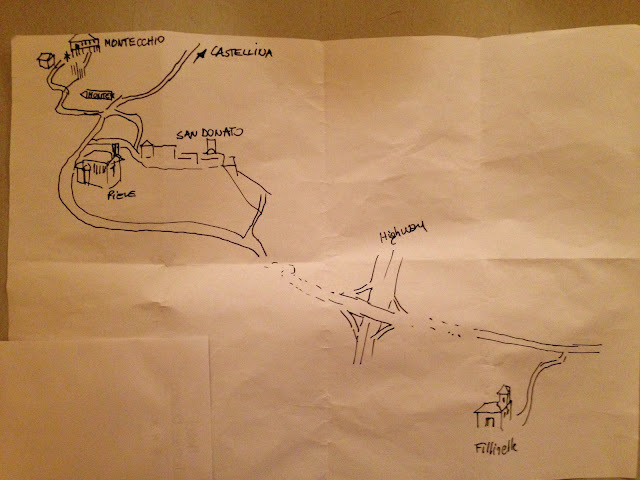 They were flexible with there arrangements and also sent the boy's on an Adventure to a revered Macelleria in San Donato in Poggio and then on to what was a wonderful tour and taste of wine and olive oil at the nearby Estate of Fattoria di Montecchio. "We began our cooking experience with dessert (this dish needed the most time to prepare, cook and cool), a delicious apple cake with almond butter (frangipane). With the help of Manuela and Silvio, we quickly had the dough mixed and smoothed into the bottom of the pan, the apples peeled, sliced and arranged with the frangipane. Once our dessert was in the oven, we began working on our fresh tomato sauce. Together we cut onions, celery, carrots and tomatoes into large pieces and placed them in a pot with olive oil and garlic to begin cooking. Next up was our homemade fettuccine. We mixed and kneaded and kneaded some more (what an arm workout!). While our pasta dough sat we began work on our stuffed turkey breast. Silvio peeled the grapes while we chopped fresh rosemary and sage. The turkey breast was stuffed, rolled, closed and then placed in a pan with hot oil to begin browning. We later added broth and wine and allowed the turkey to continue cooking while we continued work on our pasta and sauce. Manuela later guided us through the process of making a fantastic and easy to make Crostini Stracchino and sausage Antipasti. When the boys returned from their adventures, we sat down to a delicious meal paired with wine (provided by Silvio). 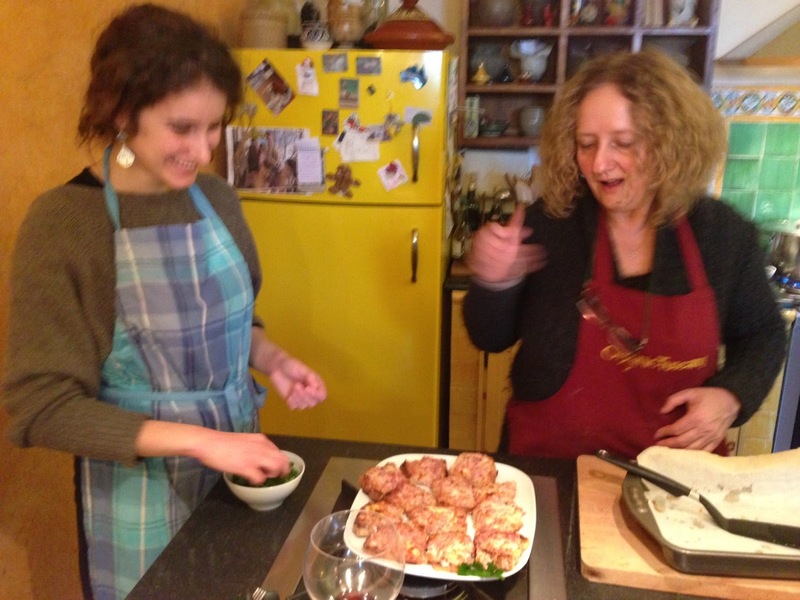 We had a wonderful time learning to cook Italian with Manuela and her family! Her patience and willingness to let us almost fail was a very enjoyable experience. Silvio and their delightfully sweet daughter were such a great help in keeping our kitchen mess to a minimum and providing us with assistance and support as needed. It was a great experience that was made even better by being able to sit down and enjoy the meal with everyone immediately after preparation. We’re pretty sure the boys enjoyed it. Neither of their plates looked like they needed washing when they were done (and that was after eating seconds)." Hear hear. Kiwi and Koala were very satisfied. We really did enjoy the amazing food with wonderful people and some great wine provided by Silvio. Grazie mille! The day was one we will always remember fondly and we all give Authentic Tuscany - Cooking Classes in the Chianti hills a hearty 'recommend'. Now before some of you chuck a wobbly at us screaming 'you guys often skip the whites!' Just know that the only time we won't taste what is offered is if there is a limit on the tastings or we have been tasting a lot of reds for a while and realise we would not appreciate the potentially nice white wine being offered. The reality is the weather, clone, vineyard, vineyard practices, harvest conditions, crush methods, the TLC, the storage container and style of the winemaker, can and often and will, make more difference in a wine than variety of fruit. I don't like Merlot! Wanker! While from time to time the industry jumps on a bandwagon and rush to produce their version of the latest consumer fad and when this happens there is often a plethora of that wine that is, well less than good, which after a while can create a backlash of 'I don't like _____'. But that is not the grape varieties fault! Look there is no shame in using the dump bucket so go ahead and taste and for those wines you don't care for dump em! Give em a couple sniffs and a couple sips and think about what you smell and taste and then decide. The thing is, you may miss the best wine of the day if you don't give em a go. So check your prejudice at the cellar door and dive into whatever is offered and who knows, you may be pleasantly surprised! Go on, av a go ya mug! That there are those among us, you've met them as have we, who assume that they know enough about a wine to chuck it in the bin after one go around. Quite pretentious and perhaps a little arrogant. There are a ton of reasons that can make a wine show poorly, from temperature and handling, to not so clean or soapy glassware. It could even be bottle or transportation shock, if you’re a believer in these phenomena. There is the possibility that the cork in that one bottle is to blame. There is even the possibility that one may have a bad palette day. Hey, it happens to the best of us. Ok maybe not us, but pretty much everyone else! It could even be the other way around when you were having a good pallet day or were having one of those magic tasting or drinking moments with food and friends, and the next time you go to the bottle of amazing wine to share it’s a big embarrassment as now you are wondering what you saw, er we mean tasted in this impostor. We know your not to chuffed about giving a wine a second chance once you've sussed it out and decided you don't like it, but we can tell you that at times we've been pleasantly surprised by a wine on the second go 'round. Sometimes something as simple as just a few extra months in the bottle can make a significant difference. It all boils down to having an open mind and realizing that we all (ok, not us) make mistakes or at least judge to fast and harsh sometimes. So next time you don't have a good experience with a wine, don't be so quick to blame the wine! Go back sometime down the track and give it another go! Let’s face it, none of us (especially us) like to think that first impressions are what mark us for life. So don’t be a hater , let bygones be bygones and drink with a forgiving heart. While getting the scrumptious lamb chops ready for the evening meal there was a rising pressure to select something from the wine fridge that would pair well and make this a special meal, even if it was a week night at home. What was the special occasion? Just because! That is all, nothing more than from time to time it is nice to have a special meal with special wine and enjoy the process of preparing, cooking, eating good food and and drinking fine wine. So it was with a little trepidation that the search of the wine fridge began. 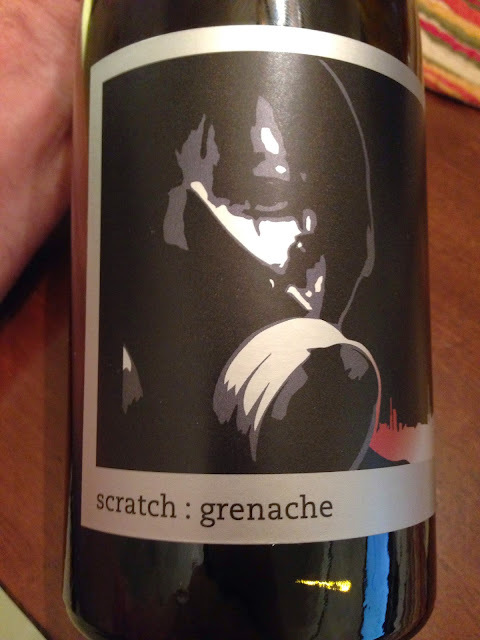 A lovely Shiraz perhaps, or this Bordeaux blend, but wait look here, a Grenache from Scratch Wines! Now confession time. The wines of Sabrine Rodems almost always are an easy go to no matter what label is on the bottle and since it had been a while since a Grenache was the chosen wine this was to be the #weeklywinner. 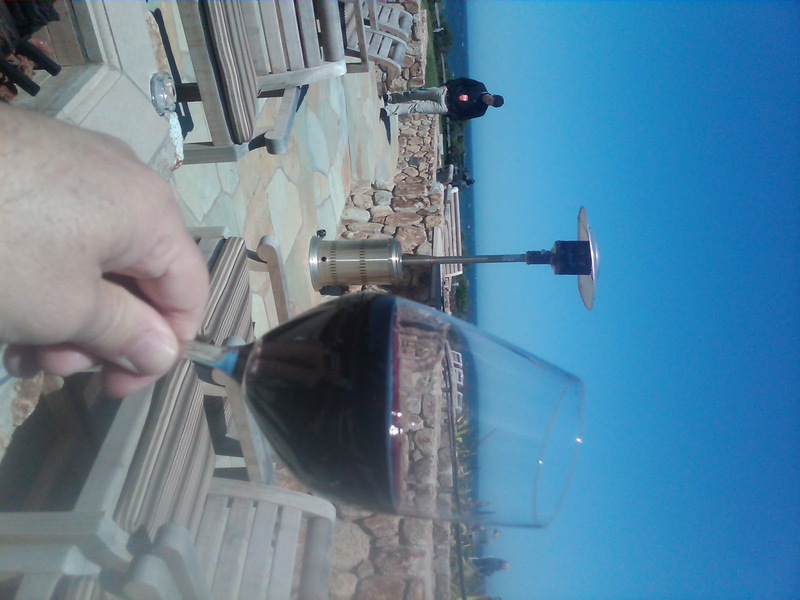 Now this weeks winner the 2011 Grenache from Scratch Wines is a bit pricier than what we usually look for but this was after all going to be a special nights meal wine. 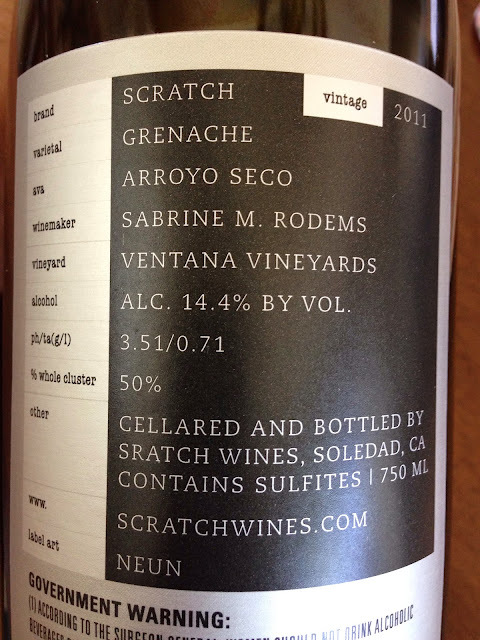 Scratch is a project of Winemaker Sabrine Rodems producing small-lot Riesling, Grenache and Pinot Noir from the Arroyo Seco and Santa Lucia Highlands AVA's. Sabrine has been making wines from these vineyards and in the Monterey area for over ten years. This is a silky seductive wine that not only went beautifully with lamb chops (special dinner requirement fulfilled!) but will go with steaks or any meat with a smoky, charred BBQ'y edge. It shows delicious cherry and spice, plum, and black cherries with a hint of nutmeg and black pepper, with a lovely silky texture. Made from 100% Grenache with 50% whole cluster, it’s balanced well by fine acidity. The oak influence shows a deft touch in winemaking and has a nice slow finish showing subtle tannins. A slightly spicy Grenache from the gravely soils of the Arroyo Seco. On a technical level we would call this a bloody good drop! A truly lovely wine that rates a solid 7 and ***. 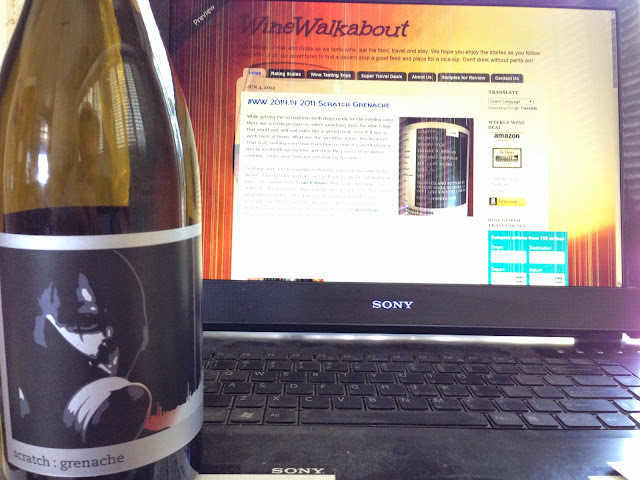 Get online and order some Scratch Wines and experience the wonderful winemaking style of Sabrine. We 'recommend' you do. There are places to eat dinner and there are places to dine but very few are so spectacular that they almost defy description. One of those places is in the desert near one of the most incredible natural wonders of the world, Uluru (commonly as Ayer’s Rock) and this dinner is called "The Sounds of Silence".. The Adventure begins as the bus pulls up out front of Sails in the Desert Hotel a beautiful high end 5 star resort Hotel about one hour before sunset. 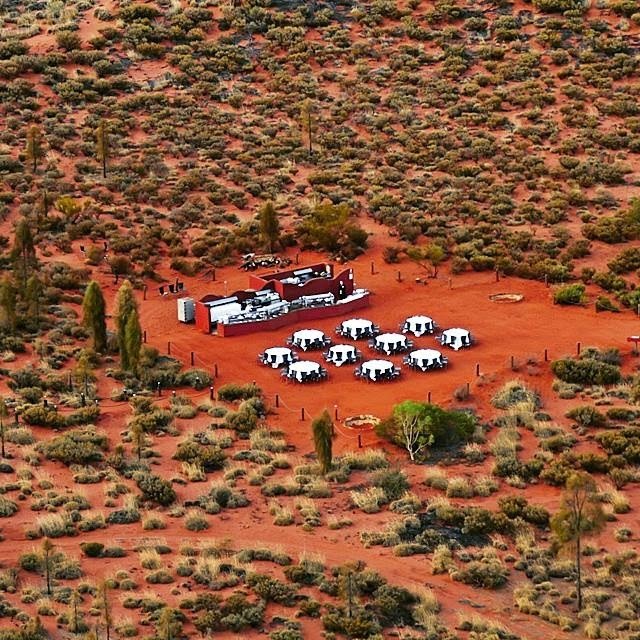 The luxury bus ride along red sand roads lasts only about ten minutes and takes you near a large sand dune not too far from Uluru. You then stroll up to the top where you are greeted with Sparkling wine and hors d’oeuvres and for your listening pleasure to verbal and musical stories from a local of the area. All the while, the sun gets lower and the red rock changes color’s of red. A magical start to the evening, with the sun setting, sipping that lovely bubbly listening to the sounds of the didgeridoo reverberating through the desert you feel incredibly small and yet a part of this magical land. As the sun continues to disappear you are escorted to the dining area. 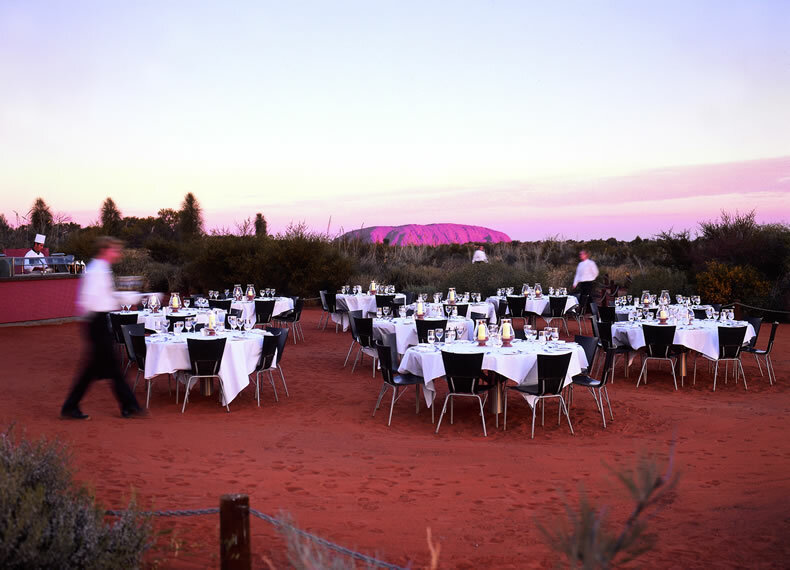 A series of white table cloth tables literally set up in the middle of the desert with an unobstructed view of Uluru changing colors and slowly and majestically disappearing into the darkness and an introduction to Aboriginal culture with a traditional dance performance under the outback sky. But even as the darkness settles in you can feel the presence of this incredible monolith, and if you stand in the darkness and let your eyes adjust you can see the silhouette against the starlight. For dinner you get to feast on a BBQ buffet of authentic Australian delicacies, examples include barramundi, kangaroo and crocodile, bush salads and classic desserts, complemented by Australian beer and wines and while this happens the millions of stars come out to welcome you. One minor complaint is I would have liked a higher end wine (I know, ponce). As the story teller said "the more wine you drink the more stars you see" I saw a lot of stars! Until you have seen the stars in the desert you haven’t seen stars! 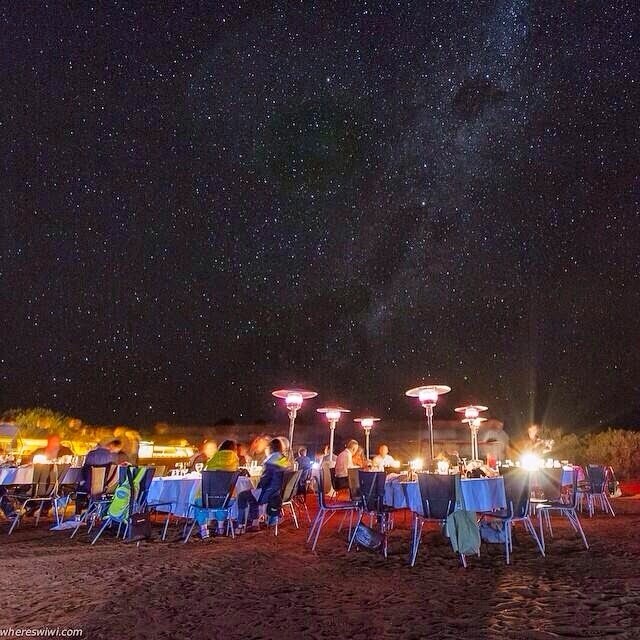 After dinner a star story teller or startalker, takes you on a tour of the spectacular southern night sky, spinning tales and telling stories of the dreamtime as they relate to the stars bringing magic to the sky. There are also some telescopes set up for viewing the moon and stars and even the occasional planet. This night we saw the rings of Saturn with amazing clarity. The evening is about four hours long and will give memories for a lifetime. This is a highly recommend evening that is a Must Go! Take a morning flight and see Uluru from a different perspective. 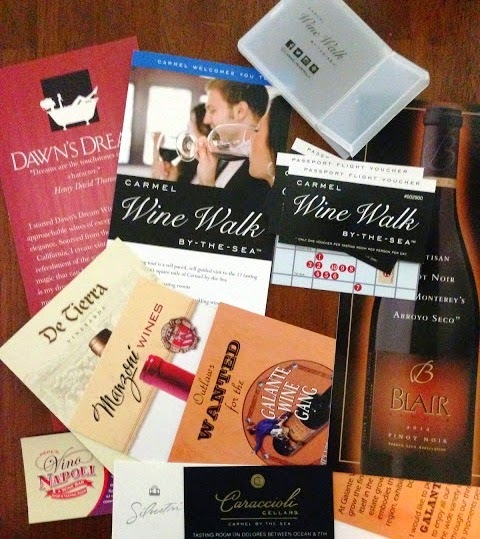 We know you have read all about the Carmel Wine Walk by-the-Sea in a previous article and are just waiting to read about the all the tasting rooms prior to purchasing your Passport (purchase here) and planning your own personal Carmel Wine Walk.by-the-Sea. In numerical order off the list we rolled up our sleeves and put our big boy pants on (don't drink without pants) and set about getting the scoop. We had started at the top of the list at number one and this is numbers 9-12. Here are the links to 5-8 and to 1-4. A Wine Tasting Passport, that for $65 entitles the buyer to one $10 flight at any nine of the twelve tasting rooms who are part of this experience (a $90 value). It can be used in one day (big day, we're up to try) or spread out over a weekend (easy peasy), several weeks, months, or even years, as the tastings never expire. In the next two quaint little tasting room's you get a double opportunity. 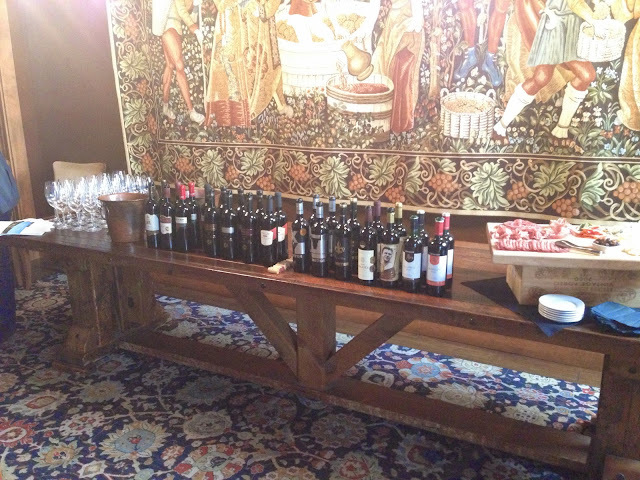 To taste the wine of two small family owned wineries in this single space. 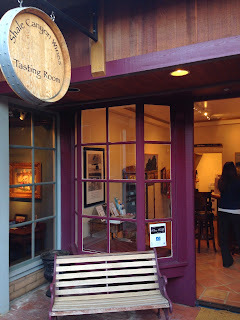 Tasting rooms 9 and 10 occupy a single roomy space with two entry doors. Blair Estate is a small family owned producer that farm the Arroyo Seco district in Monterey County. For five generations their family has lived and farmed here. They are proud to share the wines they produce from this unique area said Jeffrey Blair. 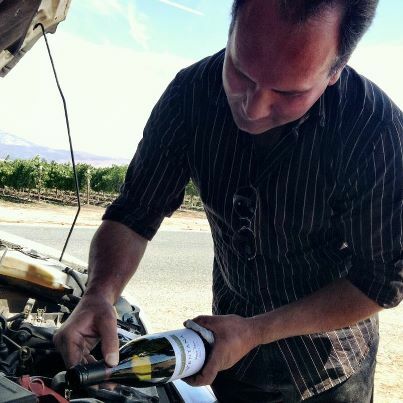 On a family property that goes back to the 1920's Jeff Planted Delfina’s Vineyard in 2007 and considers it the very heart and soul of the Blair Estates’ label. Named after their matriarch and beloved grandmother. Today, Delfina’s Vineyard and the Blair Estate is planted to just over five acres of Pinot Noir, almost two acres of Chardonnay, and one block of Muscat. The “micro” nature of the project allows complete and total quality control from the vineyard to the bottling line and what Jeff calls truly artisan, limited releases of Blair Pinot Noir. A fun place as Jeff or his brother are almost always the ones pouring and so stories of the area and wines abound. 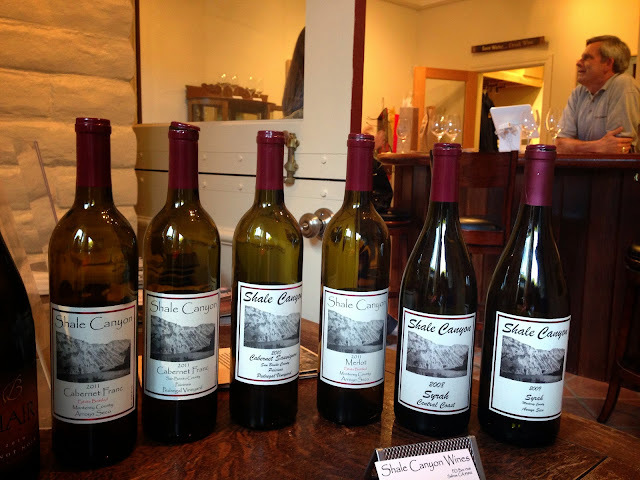 Their motto at Shale Canyon is 'If you are looking for quality, small lot, hand crafted wines, then look no further'. With production at 1200 cases they are quite small. The wine style is a little more warm climate as they farm in the Arroyo Seco AVA. Their wines are 100% barrel aged but they only use 20-30% new French oak so as not to overpower the wine. This again is a small family run winery and the vineyards are farmed using the SIP philosophy although they have not gone through final certification just yet. They are also 100% off the grid solar powered and very proud of it. With Chardonnay, Syrah's, Merlot, Cabernet Franc and Cabernet Sauvignon to taste there is sure to be something for everyone. 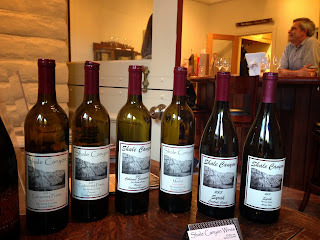 For a winery with such an awarded line of wines it is a surprise to learn that they are a truly small batch operation. The tasting room is well appointed and has a classy feel and yet is inviting and very comfortable. Fully SIP Certified and producing wines in 150-200 case lots this is wine that is 60% Estate and 40% hand selected vineyards. 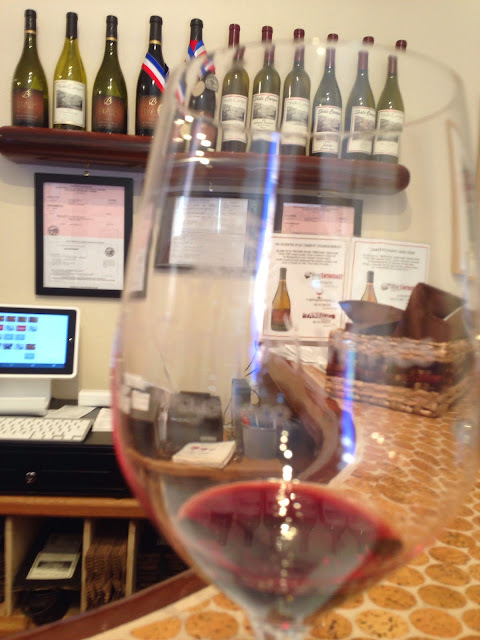 With your passport you get to try 4 of any of their 10-12 wines open on any given day. 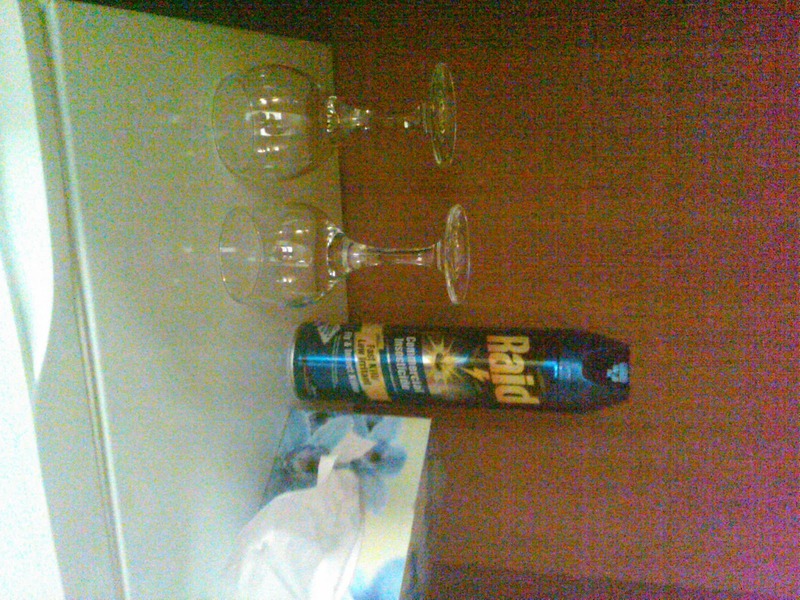 Tasting out of classy, beautiful and wine worthy glassware just enhances an already lovely experience. They even change the glassware for side by side comparing. Class act! 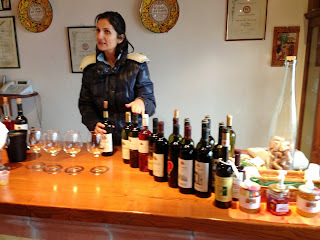 The staff is very well educated on the wines and the vineyards and this makes for an added bonus, having great conversation about wine and wine style and the different vineyards and wine making practices. 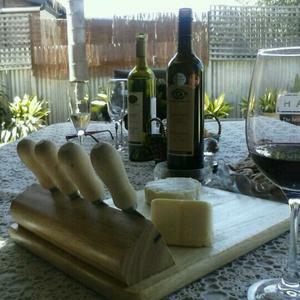 They offer a great cheese plate that was voted 'Best cheese plate in Monterey County'. 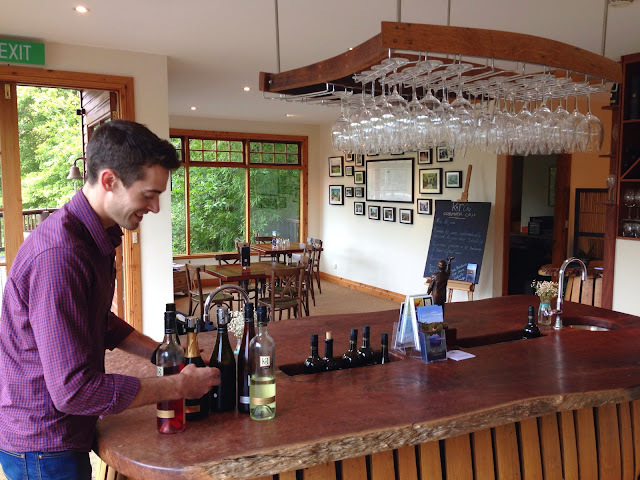 Highly awarded wines with knowledgeable and friendly staff in a classy environment this is one tasting room to put high on your list. 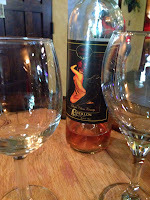 If you have been paying attention you will have noticed a theme with most of these wineries. 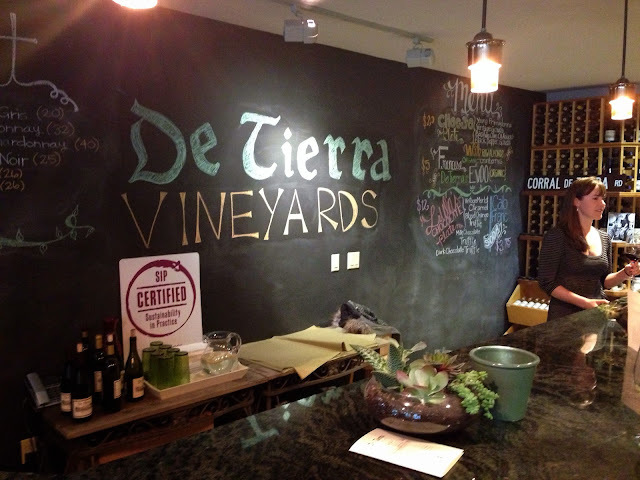 They are family owned and De Tierra is no exception. With 85% of their wines Estate grown and the other 15% with good friends. We had the pleasure of Anna Russell leading us through a tasting and telling us of the philosophy of the Family owned and operated De Tierra Vineyards. One example was the Russell Estate Vineyard. The grapes grown at the Russell Estate Vineyard are 100% Organic and sustainable practices are used in the farming. The Russell Estate Vineyards uses owl hutches, ladybugs and lavender to manage pests, while avoiding herbicides and fertilizer when possible through the use of cover crops, netting and fencing. This vineyard is run entirely on solar energy, and hand farming practices are used whenever possible. This carries over into the tasting room. This is a really cool tasting room and once Anna pointed out and explained some of the unique things they had done to bring the sustainable into this comfy place it took on even more significance. Simple things like the chalkboard that serves as a tasting flight information board or to announce specials so they don't have to print those things up. Brilliant and looks really cool. Comfortable, friendly and down to earth (pun intended) this is a great spot for a great taste. There you have it. 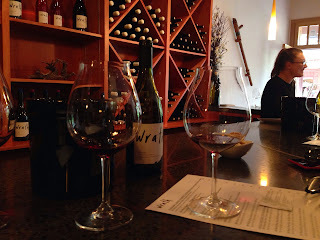 We have tasted at all of the Carmel Wine Walk by-the-Sea tasting rooms. We Really enjoyed the process and will be returning to stay up to date on all the new releases. The difficulty will be finding your favorites. We hope that by reading our experiences it will help guide you in a direction, but no matter which ones you choose just know it will be good to great. 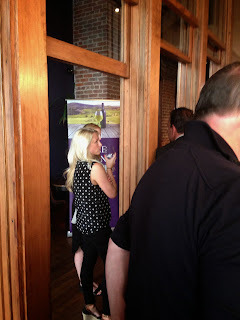 We have also heard that there are some more tasting rooms already signed up for the program and so we will be hunting them down soon to let you know whats coming and hopefully get a look a a couple restaurants. Hey we signed up for all this hard work. 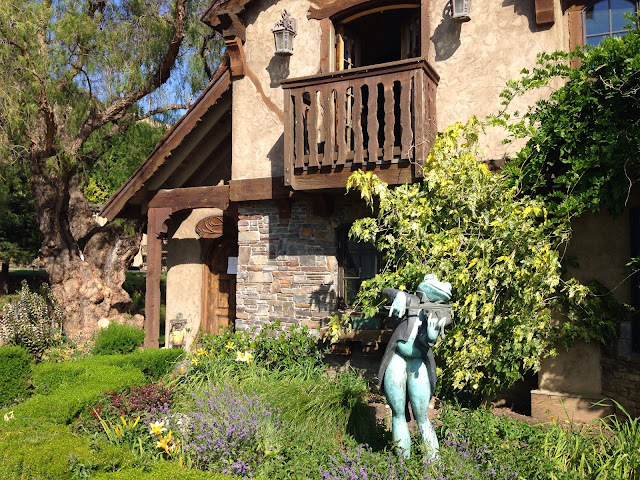 Go and enjoy what these lovely tasting rooms have to offer and as well as the quaint beauty of this sea side hamlet as you create your own Carmel Wine Walk by-the-Sea. Just a thought. 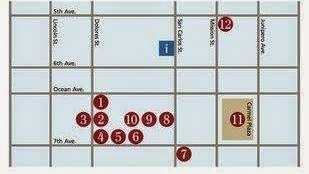 If you buy two passes you can share a couple and visit all these worthy tasting rooms! Brilliant!